In the Alps, cables were used for transport starting at the end of the 1800s. Not for recreational purposes, but for industry. However, the use of cables for transport started in Europe as early as the Middle Ages and even earlier in Asia. A surprising story of inventiveness, ranging from wool fibres to relieving traffic jams in cities and illustrating human ingenuity when it comes to making life easier. 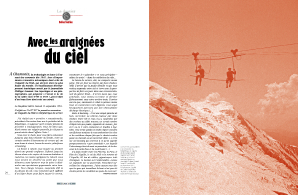 In Chamonix, cable technology targeted the summits as early as 1945 with a number of major installations, including the Aiguille du Midi lift which at the time was the highest in the world. This development in tourism has been studied by the journalist Philippe Gaussot. 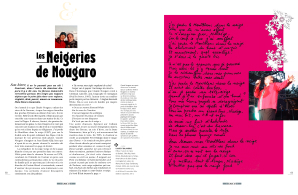 His reports and photos presenting « the lift-off of the valley and life there from 1944 to 1959 » are the topic of a striking book from which this excerpt is drawn. In the 1800s, lumberjacks in the Italian Alps were pioneers in developing new logging techniques for steep terrain. Their cable systems appeared very rustic, but were in fact highly complex to operate and their know-how was soon in demand throughout the Alps. Never abandoned over the years, the system is now staging a comeback. 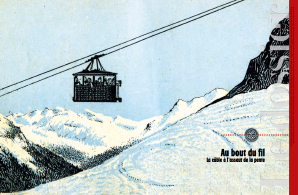 Born in the mountains for winter sports, the Pomagalski company from the Grenoble region has become one of the world leaders in cableways. 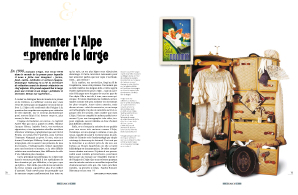 Ever since the first lift slapped together by Jean Pomagalski in the Oisans mountains in 1936, the company has constantly innovated and applied its know-how to unexpected market niches. The ability to fly over streets, rivers, buildings and traffic jams is a dream come true in many cities thanks to cableways. For years limited to tourism and the mountains, they are now injecting new life into urban transportation networks. Cables, pylons and pulleys. 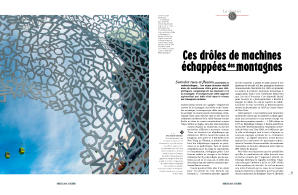 Are they a necessary evil or a poetic new art form in mountains ? For the photographer Zir, it is clear, they possess true beauty whose mystery is revealed in the photos of his Cable Mountains series. Unexpected angles, abstract lines and supernatural lighting render tribute to cableways in the form of a strange, metallic poem. From the six large Alpine countries, a selection of emblematic cableways outstanding for their historic value, originality or the beauty of the site. This major artist, born in the Alps, will have his first large exhibition in France, in the Grenoble museum, since the retrospective at the Pompidou Centre ten years ago. An excellent occasion to meet in his home this strong and engaging figure among contemporary artists. 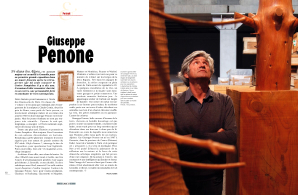 How did Giuseppe Penone develop such a close relationship with the Alps ? An exclusive interview in which the Italian artist evokes his relationship with nature and with his small mountain village, surrounded by forests where the Piedmont and Liguria meet. The beautiful white flakes flutter everywhere in the songs of the artist who died ten year ago. Though not always Alpine in nature, they rhyme with childhood, virginity, desire, purity, love and renewal. The Swiss artist developed a new way of looking at the Alps in the 1700s, during his travels to paint on-site the high-altitude landscapes. His Remarkable Sights signal a forerunner to the romantic school. An exhibition at the Fine Arts museum in Basel outlines the career of the pioneering artist. 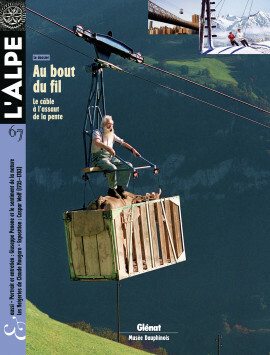 In 1998, L’Alpe was born. A true UFO in the publishing sector for which we had to invent everything, including the format, content, tools, methods and, above all, the team.